Our Pink Freshwater Pearl Cluster & Rhinestone Drawer Knob has sparkle, shine and a timeless elegance to your furniture piece. 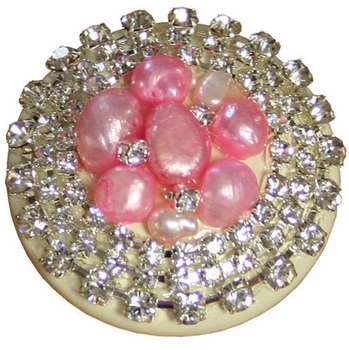 These knobs will look amazing on a nightstand, vanity or desk in your little girl's room. Pretty in pink. The magic is how you put it all together and create a look! No matter the room you are designing we truly believe there is a magical moment when the finishing touches all come together and create exactly the look you were going for. Country Cottage accessories and room decor items will add that final touch to any nursery or little girls room. With a pinch of personalization and a hint of sparkle our accessories truly are unique and bring out the "one of a kind" details that our customers love. Their handcrafted accessories make a statement and leave a lasting impression for all who see them. Accessories are custom made to order and ship directly from the designer.